The construction of aircraft fuselages evolved from the early wood truss structural arrangements to monocoque shell structures to the current semimonocoque shell structures. The main drawback of truss structure is its lack of a streamlined shape. In this construction method, lengths of tubing, called longerons, are welded in place to form a wellbraced framework. Vertical and horizontal struts are welded to the longerons and give the structure a square or rectangular shape when viewed from the end. Additional struts are needed to resist stress that can come from any direction. Stringers and bulkheads, or formers, are added to shape the fuselage and support the covering. Figure 3-14. 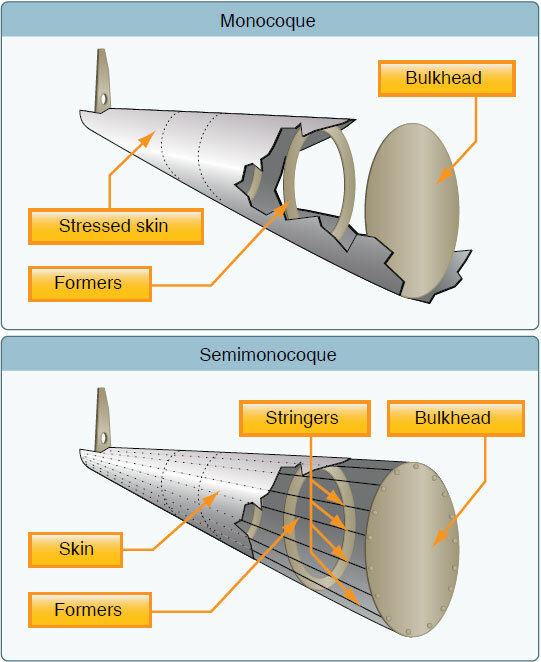 Semimonocoque and monocoque fuselage design. Monocoque construction uses stressed skin to support almost all loads much like an aluminum beverage can. Although very strong, monocoque construction is not highly tolerant to deformation of the surface. For example, an aluminum beverage can supports considerable forces at the ends of the can, but if the side of the can is deformed slightly while supporting a load, it collapses easily. Because most twisting and bending stresses are carried by the external skin rather than by an open framework, the need for internal bracing was eliminated or reduced, saving weight and maximizing space. One of the notable and innovative methods for using monocoque construction was employed by Jack Northrop. In 1918, he devised a new way to construct a monocoque fuselage used for the Lockheed S-1 Racer. The technique utilized two molded plywood half-shells that were glued together around wooden hoops or stringers. To construct the half shells, rather than gluing many strips of plywood over a form, three large sets of spruce strips were soaked with glue and laid in a semi-circular concrete mold that looked like a bathtub. Then, under a tightly clamped lid, a rubber balloon was inflated in the cavity to press the plywood against the mold. Twenty-four hours later, the smooth half-shell was ready to be joined to another to create the fuselage. The two halves were each less than a quarter inch thick. Although employed in the early aviation period, monocoque construction would not reemerge for several decades due to the complexities involved. Every day examples of monocoque construction can be found in automobile manufacturing where the unibody is considered standard in manufacturing. Semimonocoque construction, partial or one-half, uses a substructure to which the airplane’s skin is attached. The substructure, which consists of bulkheads and/or formers of various sizes and stringers, reinforces the stressed skin by taking some of the bending stress from the fuselage. The main section of the fuselage also includes wing attachment points and a firewall. On single-engine airplanes, the engine is usually attached to the front of the fuselage. There is a fireproof partition between the rear of the engine and the flight deck or cabin to protect the pilot and passengers from accidental engine fires. This partition is called a firewall and is usually made of heat-resistant material such as stainless steel. However, a new emerging process of construction is the integration of composites or aircraft made entirely of composites. The use of composites in aircraft construction can be dated to World War II aircraft when soft fiberglass insulation was used in B-29 fuselages. By the late 1950s, European high performance sailplane manufacturers were using fiberglass as primary structures. In 1965, the FAA type certified the first all-fiberglass aircraft in the normal category, a Swiss sailplane called a Diamant HBV. 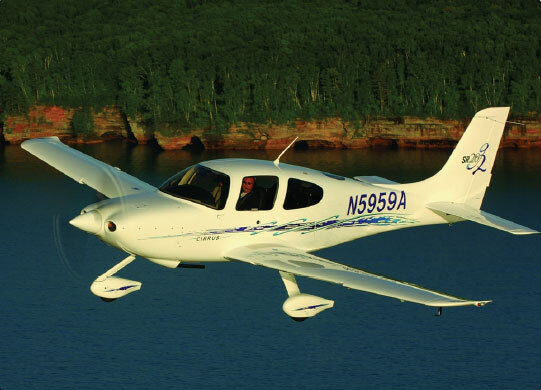 Four years later, the FAA certified a four-seat, single-engine Windecker Eagle in the normal category. By 2005, over 35 percent of new aircraft were constructed of composite materials. Composite materials are fiber-reinforced matrix systems. The matrix is the “glue” used to hold the fibers together and, when cured, gives the part its shape, but the fibers carry most of the load. There are many different types of fibers and matrix systems. In aircraft, the most common matrix is epoxy resin, which is a type of thermosetting plastic. Compared to other choices such as polyester resin, epoxy is stronger and has good hightemperature properties. There are many different types of epoxies available with a wide range of structural properties, cure times and temperatures, and costs. The most common reinforcing fibers used in aircraft construction are fiberglass and carbon fiber. Fiberglass has good tensile and compressive strength, good impact resistance, is easy to work with, and is relatively inexpensive and readily available. Its main disadvantage is that it is somewhat heavy, and it is difficult to make a fiberglass load-carrying structure lighter than a well designed equivalent aluminum structure. Carbon fiber is generally stronger in tensile and compressive strength than fiberglass and has much higher bending stiffness. It is also considerably lighter than fiberglass. However, it is relatively poor in impact resistance; the fibers are brittle and tend to shatter under sharp impact. This can be greatly improved with a “toughened” epoxy resin system, as used in the Boeing 787 horizontal and vertical stabilizers. Carbon fiber is more expensive than fiberglass, but the price has dropped due to innovations driven by the B-2 program in the 1980s and Boeing 777 work in the 1990s. Very well-designed carbon fiber structures can be significantly lighter than an equivalent aluminum structure, sometimes by 30 percent or so. Composite construction offers several advantages over metal, wood, or fabric, with its lighter weight being the most frequently cited. Lighter weight is not always automatic. It must be remembered that building an aircraft structure out of composites does not guarantee it will be lighter; it depends on the structure, as well as the type of composite being used. A more important advantage is that a very smooth, compound curved, aerodynamic structure made from composites reduces drag. This is the main reason sailplane designers switched from metal and wood to composites in the 1960s. In aircraft, the use of composites reduces drag for the Cirrus and Columbia line of production aircraft, leading to their high performance despite their fixed landing gear. Composites also help mask the radar signature of “stealth” aircraft designs, such as the B-2 and the F-22. Today, composites can be found in aircraft as varied as gliders to most new helicopters. Lack of corrosion is a third advantage of composites. Boeing is designing the 787, with its all-composite fuselage, to have both a higher pressure differential and higher humidity in the cabin than previous airliners. Engineers are no longer as concerned about corrosion from moisture condensation on the hidden areas of the fuselage skins, such as behind insulation blankets. This should lead to lower long-term maintenance costs for the airlines. Another advantage of composites is their good performance in a flexing environment, such as in helicopter rotor blades. Composites do not suffer from metal fatigue and crack growth as do metals. While it takes careful engineering, composite rotor blades can have considerably higher design lives than metal blades, and most new large helicopter designs have all composite blades, and in many cases, composite rotor hubs.